"I want people to know that these kids should still have the same opportunity as everybody else." Public schools are facing budget cuts throughout the US, putting kids in precarious situations further at risk. 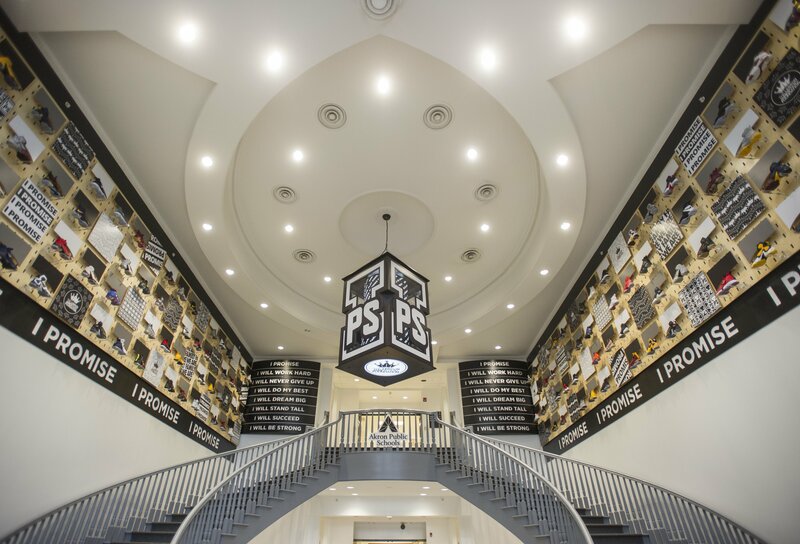 LeBron James’ I Promise school is a vision of what a robust public school can look like — well-funded, holistic, and inspirational. You can take action for universal quality education here. When LeBron James was in the fourth grade, he missed around 100 days of school because of a lack of structure in his life. The basketball legend might’ve fallen further behind and eventually dropped out had it not been for the help of a sports mentor, but James ended up returning to school on a regular basis — and the rest is history. Now James wants to pass on his good fortune to similarly struggling youth, according to SB Nation. On Monday, James opened the “I Promise” school, a collaboration with Akron Public Schools in Akron, Ohio, which seeks to help kids who are behind in their educations get back on track. The school currently serves 240 at-risk third and fourth graders, but will expand each year to eventually span first grade through eighth grade, SB Nation reports. James is the primary donor of the school and his experience informs the school’s above-and-beyond approach to learning. Here are seven amazing aspects of the I Promise school. James said that for many kids who grow up in poverty, time outside of school can be dangerous because of potential exposures to violence and bad habits. The I Promise school will be open longer than normal schools, with regular school hours going from 9 a.m. through 5 p.m. and extracurricular activities afterward. There will also be a seven-week summer camp each year, according to the Los Angeles Times. And James' commitment to the students doesn't end there. He's promised to fund college tuition at Akron University for all students who complete the I Promise curriculum. Throughout the US, 41 million people struggle with hunger, including 13 million kids, according to Feeding America, which has a enormous impact on their ability to concentrate and learn in school. To make sure students are getting what they need to eat, they'll receive free breakfast, lunch, and snacks throughout the day. The I Promise school also has an on-site food bank stocked by the Akron-Canton Regional Foodbank to include fruits, vegetables, and everyday staples. Kids have a harder time thriving if they’re guardians aren’t thriving, so in its mission to be holistic, the I Promise school will help parents succeed in life with GED classes and job training programs, according to the Times. Early childhood trauma can significantly impair a student’s ability to learn. Similarly, ongoing stress and trauma in a student’s life can be harm his or her ability to process information, regulate emotions, and much more. The I Promise school will offer both therapy and classes on how to deal with trauma. James often says that his childhood bicycle gave him a sense of freedom that prevented him from going down the wrong path. As a result, he’s giving every student in the school a new bicycle. For kids who live nearby, having a bike is also a great way to commute to school. A growing educational disparity in the US involves internet access, and while the I Promise school isn’t equipping each student’s home with Wi-Fi, each student is receiving a Chromebook laptop made by Google so they can do their homework and study. As schools around the country face problems from crumbling ceilings and walls to insect infestations to failing central air systems, the I Promise school sets a different example. The school has state-of-the-art classrooms and laboratory spaces, inspirational murals throughout, and areas for after-school activities.